I LOVE Thai food. Curry, Pad See Ewe, and of course Pad Thai. But let’s be honest – takeout is usually not the healthiest of choices. Nor does it help to keep my wallet full! 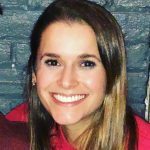 It always seems like a good idea – you’re like “JUST THIS ONE TIME,” “ITS A TREAT!” “I PROMISE I’LL BE GOOD TOMORROW” – and then one week later, the cravings return. So what can you do when you’re belly is screaming for Pad Thai but your waistline and wallet scream no? 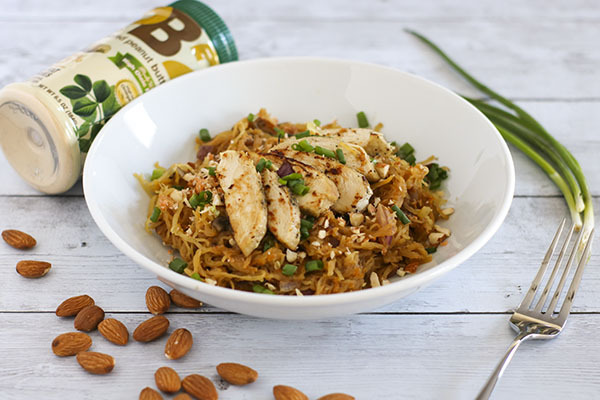 Enjoy some deliciously healthy and homemade Spaghetti Squash Pad Thai! What the heck is spaghetti squash? Really, you are not joking? OMG WHERE HAVE YOU BEEN YA CRAZY? Spaghetti squash is AMAZING! It is easy to cook, easy to prepare, and of course, easy to eat! It has a very subtle flavor, which allows any sauce, veggie or meat to really stand out and shine. I don’t care who you are, what you say, if I could eat real spaghetti for the same number of calories as spaghetti squash, I would choose real spaghetti every time. Come on now – let’s not be crazy. But spaghetti squash is STILL delicious! In the same way, many veggie burgers are absolutely delicious. No, they do not taste like meat – but they are not trying to. They are just trying to be healthy and delicious – which they are. So yay! Nonetheless, I love spaghetti squash as a healthy substitute because even though it doesn’t taste quite like spaghetti, it is still delicious! I get to enjoy whatever delicious sauce and protein I am craving without the guilt of a plate of pasta. So we all know that spaghetti squash is healthier than spaghetti – but how MUCH better is it for you? One cup of cooked spaghetti contains approximately 220 calories and a whopping 42 grams of carbohydrates. To top it off, traditional spaghetti contains very few nutrients. Comparably, one cup of cooked spaghetti squash contains approximately 42 calories, only 10 grams of carbohydrates, as well as a host of important nutrients and antioxidants – such as vitamin A and C, B-vitamins, potassium, and beta-carotene. Spaghetti squash also contains the essential fatty acids omega-3 and omega-6 – who knew? Not to mention, who just eats one cup of spaghetti?? People with control – I am not one of those people, that is for sure. So if you have taken a peek down at the recipe below – you may be seeing this ingredient called “PB2.” If you are like “duh, I use PB2 E’ERYDAY!” Feel free to skip this section of the post. If you have no idea what the heck this PB2 stuff is – read on. I know… Sounds like a dream, right? Well – yes and no. PB2 has an awesome nutty flavor and can greatly reduce the number of calories in a peanut butter based recipe. Having said that, there are benefits to eating small amounts of full fat peanut butter than PB2 will not provide. Also, let’s not be mistaken – just as spaghetti squash is not spaghetti. PB2 is definitely not peanut butter. BUT ONCE AGAIN, it is still great when used in the right scenarios – a.k.a. IN THIS RECIPE! 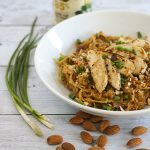 PB2 is fabulous in this Spaghetti Squash Pad Thai recipe because it provides the perfect nutty peanut butter flavor, without the fat and pastiness of peanut butter. Its not like you would ever eat restaurant Pad Thai and think – mmm peanut butter. No way. But you can taste the peanuts! 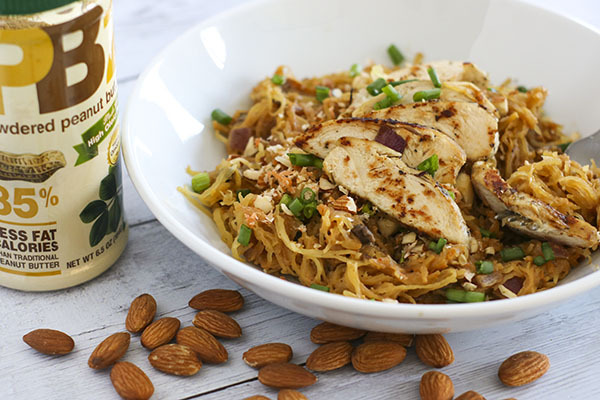 Using PB2 provides that strong, delicious peanut flavor to this Spaghetti Squash Pad Thai without all the fat of using real peanuts, peanut oil, or peanut butter. There is not much! You are going to have to try it to believe how good it is – but I promise you won’t be disappointed. This recipe, like many of my recipes, can be totally customized. Replace the chicken with tofu, shrimp, beef, egg, or tempeh. Add extra vegetables like bean sprouts, water chestnuts, pepper or corn. Play around! Taste the sauce before you pour it all on – add more PB2, soy sauce, or hot sauce if your taste buds are calling for it. Don’t be afraid to play around! Every restaurant makes its Pad Thai a little different – so your FAVORITE Pad Thai may taste different than mine! 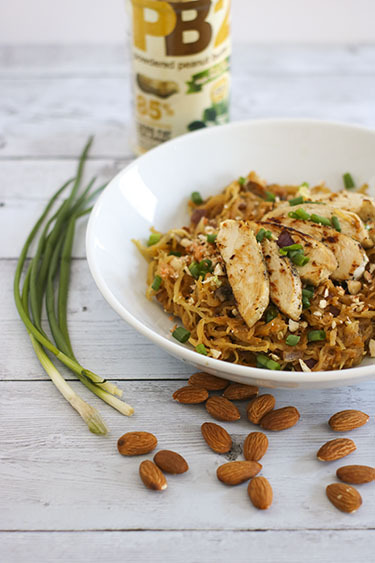 Similarly, your favorite Spaghetti Squash Pad Thai may taste different than mine! Don’t be afraid! Skip the takeout and opt for this light, healthy alternative. Full of peanut flavor, your Thai food cravings will be fully satisfied. 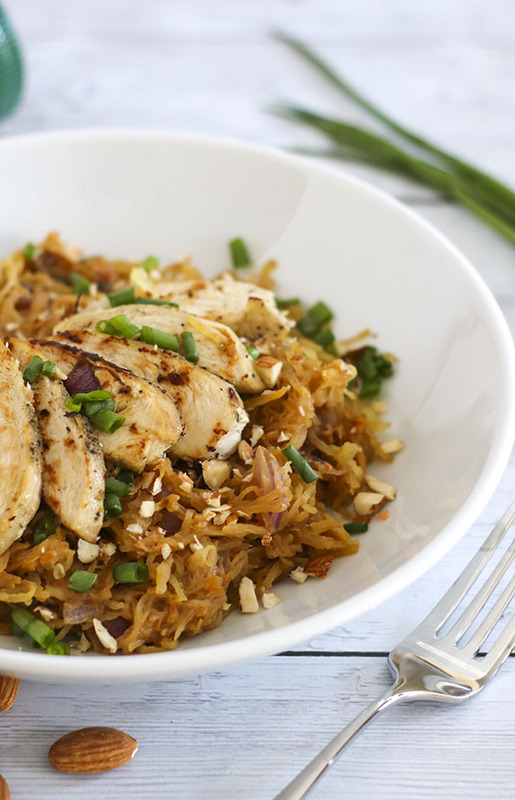 Substitute your favorite protein and veggies to make this Spaghetti Squash Pad Thai truly your own! Preheat oven to 400F. Use a sharp chef's knife to slice stem off of spaghetti squash. Slice spaghetti squash in half lengthwise then use a large spoon to scrape out seeds and stringy bits of flesh. Light grease each half of spaghetti squash with olive oil or non-stick spray. Place spaghetti squash cut-side down onto baking sheet or roasting pan. Bake at 400F for 35-40 minutes. The squash is ready when you can easily pierce a fork through the flesh all the way to the peel. The flesh will also separate easily into spaghetti-like strands. Yummy! Set squash aside to cool. In a large sauce pan, heat 1 tablespoon olive oil over medium-high heat. Add chicken breasts to pan season with salt and pepper (or your favorite seasoning). Cook 4-5 minutes on each side or until fully cooked through. Remove chicken from pan. Heat another tablespoon of olive oil in pan. Once oil has become hot, add red onion and garlic to pan, then cook for 2-3 minutes. Add mushrooms to pan, cook for an additional 5-6 minutes until vegetables have softened. While vegetables are cooking, use a fork to gently pull the squash flesh from the peel and to separate the flesh into strands. The strands wrap around the squash horizontally — rake your fork in the same direction as the strands to make the longest "noodles." Dump noodles into a large bowl. In a small bowl, combine soy sauce, rice vinegar, PB2, and sriracha/chili paste (if desired) - use a small fork or whisk to fully combine ingredients. Transfer about 4 cups of spaghetti squash and sliced chicken into saucepan with vegetables, toss to reheat and crisp. Pour about the peanut butter sauce over noodles and continue to toss until fully coated. TAKE A TASTE! See if you like the flavor - if there is too much peanut butter flavor going on, add a little extra soy sauce or another scoop of spaghetti squash. Don't be afraid to play around until you are satisfied! Finally, sprinkle with green onions and chopped peanuts and serve warm. Note: I used chopped almonds because I did not have any peanuts at the house - still tasted delicious! Storage: Refrigerate for 3-4 days in airtight container. You read my mind!! We LOVE Thai food but just can’t take the calories too often! This sounds great— can’t wait to try it! And I learned about PB2 awhile back! Thanks, Karen!! Cannot wait to hear what you think of the recipe! Enjoy!